My favourite kurma...kurma looks absolutely divine..
kurma looks colourful and nice presentation!! Hmm...mouthwatering! I cook it in a similar way! Kurma looks perfect and a nice click. 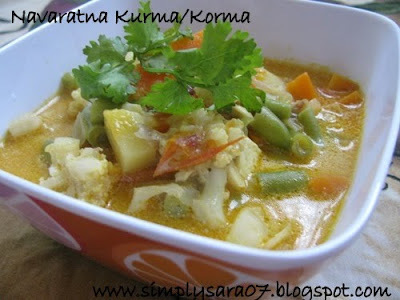 This is really healthy korma Sara, should try it soon. I'm always lover of this Kurma..I have tried at home but didn't turn out good..should try your version...this looks so yummy & colorful.. Thank you my friends for your lovely comments. Nice kurma :)... looks yummy and delicious!! Wonderful Kurma especially with all the love! A great entry for the event. nice kurma, Adding pineapple and raisins will surely give a nice taste.and above all when cooked and served with love will enhance the flavor. Looks very delicious..do join as a follower da..